Cleveland Cavaliers forward LeBron James was spotted looking at an iPad during a break on the bench during the game against the Miami Heat. James is taking advantage of a new NBA rule allowing teams to instantly upload in-game footage from iPads from behind the bench, so both players and coaches can use it, reports cleveland.com (via the Loop). Well, kind of, because Cavs don’t actually upload the footage to iPads behind the bench, but what’s important here is that James is the only Cavs player to have been seen studying an iPad during games. 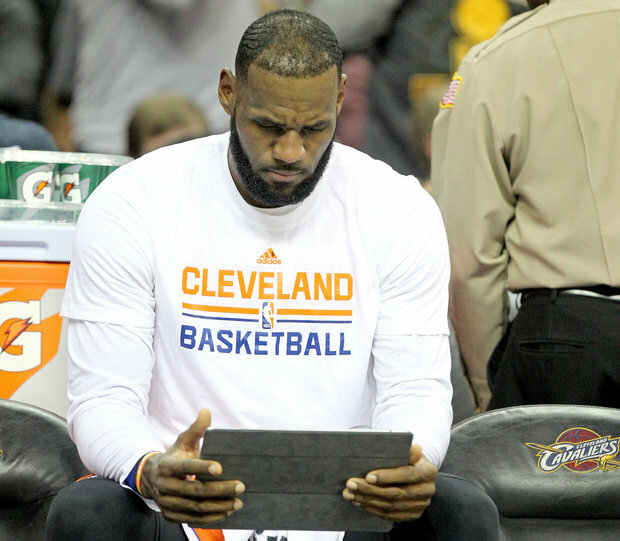 The Cavs coach doesn’t use iPads during games. The league allows teams to use iPads, but while some organizations, such as the Portland Trail Blazers, have jumped on the opportunity and use tablets often, others, such as the Hornets, are slower to adopt technology. According to assistant coach Mike Longabardi, the Cavs used iPads more in games during the playoffs and the Finals last season, but the experience is better now, because they can upload videos for review immediately at the bench. Although right now it is only James who’s using iPads, others will join in, as the team will move video equipment behind the bench.